Ad revenue from social networks worldwide is expected to reach $5.54 billion this year, according to eMarketer estimates, and will double by 2013. eMarketer is taking into account a number of popular social networks, including Facebook, Twitter and LinkedIn. Half of this year’s ad spend on social networks, $2.74 billion, is coming from the US market. Unsurprisingly, the majority of this ad revenue is coming from Facebook, which is expected to pull in over $3.8 billion this year from advertising to its 800 million members. Revenue is clearly growing, but eMarketer’s data shows that the fastest growth over the next few years will take place in ad spending outside the U.S. By 2013, non-US revenues will make up 51.9% of the total, which will hit $10 billion worldwide. In the US, social networks will make nearly $5 billion from ads that year. 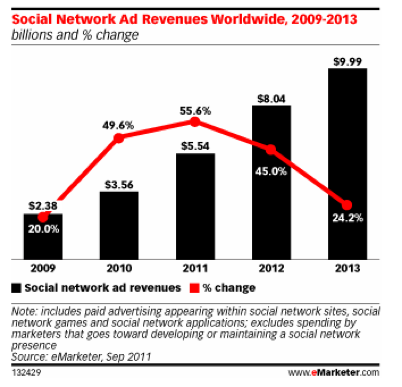 Social network ad revenue grew 50% in 2010, and is expected to increase by 55.6% this year. But growth is expected to drop to 45% in 2012, and 25.2% in 2013. We know that Twitter has been growing its ad revenue steadily, and should see even more growth once the network’s self-service product for advertisers debuts. For the first time, eMarketer actually forecasts ad revenues for professional social network LinkedIn, who has recently been rolling out a number of new, social (Facebook-like) ad formats. 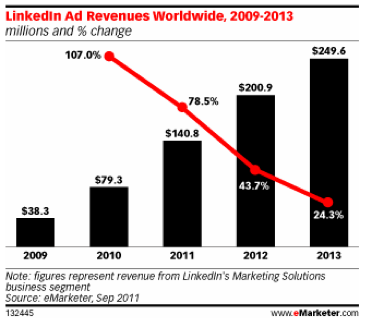 eMarketer predicts LinkedIn will account for 3% of worldwide social network ad revenues this year, with $140.8 million. The site has more than tripled its ad dollars in two years, but eMarketer cations that growth is tapering off. Ad revenue is expected to grow by 79% in 2011, but will drop in its growth rate to 44% in 2012 (with $200 million in ad revenue) and 24.3% in 2013 (with $250 million in ad revenue). Still, LinkedIn is seeing two members join each second, and has over 120 million members, so it is still a popular place for advertisers to reach consumers. In terms of all digital ad spending, 8.8% of online ad dollars in the US and 6.9% worldwide will go to social networking sites this year. By 2013, social network ad revenues will make up 11.7% of all online ad spending in the US and 9.4% around the world. Of course, one thing that this report does not factor in is brand new ad formats and how that could effect revenue in the next few years. For example, at TechCrunch Disrupt a few weeks ago, Facebook’s Product Director for Ads Gokul Rajaram said that the network is thinking about developing an AdSense for Facebook advertisers.